In order to bring more value and variety to our customers, Snackbox is joining forces with Healthy Surprise! Healthy Surprise is a California-based monthly subscription box very similar to Snackbox and has over a thousand satisfied members across North America. All their snacks are natural, gluten-free, soy free, vegan, corn free, wheat free and delicious! Healthy Surprise has extended free shipping for three months exclusively to any Snackbox customer who signs up before April 15th (how to redeem your coupon). 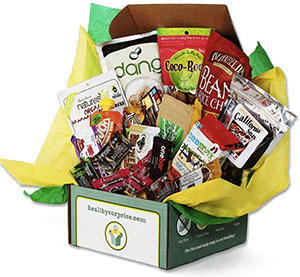 In addition, Healthy Surprise is providing a **$25 gift card** in each Snackbox customer's first month's box! Comments, questions, snack ideas? Let us know.